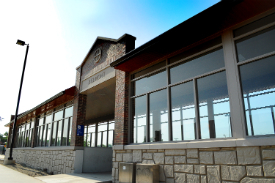 The public is invited to join representatives from Metra and Burlington Northern Santa Fe Railway (BNSF), and State and local officials to mark the completion of the Belmont Road Grade Separation project in DuPage County. The $60 million project eliminated a troublesome and dangerous intersection between Belmont Road and BNSF tracks. The occasion will be marked on Wednesday, October, 17, 2012 at 10:00 a.m. at the Belmont Road Station, 5000 Belmont Road, in Downers Grove.